My Dad, Johnny Harold Arledge passed on February 3, 2019. He was born on January 10,1927 to Ashton and Mamie Arledge of Chattanooga. He was the oldest of six children…with four sisters, Joyce, Ann, Doris and Nancy and one brother, Jim. My Dad requested a graveside service, which will be held at Chattanooga Memorial Gardens 11:00 EST, 10:00 CST, Tuesday February 5, 2019, with military honors. Dad grew up in Chattanooga and graduated from Red Bank High School. He enlisted in the Navy when he was sixteen and spent much of the war on an aircraft carrier in the Pacific. It was there he began to box; a sport that stayed with him until he met my Mom after the war, when they were both working at the telephone company. He married Melba (Nell) McKenzie in May of 1948 and one year later, they had their one and only child, a daughter, named Jeri. They were together for seventy years, and to me…a wonderful example of love and respect. He worked most of his life for Combustion Engineering and retired early at fifty-five. He loved maintaining his yard, helping neighbors, and being the best Dad any girl could hope for. He loved my Mom’s cooking more than anything, and he loved music of all kinds, and always had a song to sing and a smile on his face. He ran on the streets of Chattanooga before running was a sport…he biked more miles than I could ever hope to. He excelled at everything he tried; but don’t ask him to paint or hang wall paper…because he could instantly disappear. I went with him everywhere as a child…and have wonderful memories of the barbershop where John Barker cut his hair. My Dad gave me these things…his love and support, his love of music and a work ethic that I have found hard to live up to. I will miss his smile, his limericks, his sense of humor and his energy for life. His best friend was Winston Pennington who recently passed away at the young age of 101; and he has many nieces and nephews who will miss their “Uncle Johnny”. He told me many times that he had lived a great life and although my life will never be the same without him; I thank God for the love of this good father and for the length of time I was able to have him with me. Anyone wishing to make a donation in his memory can do so to Hospice Foundation 4411 Oakwood Drive Chattanooga, TN 37416. 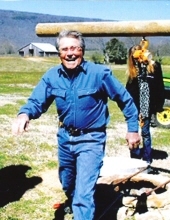 "Email Address" would like to share the life celebration of Johnny Harold Arledge. Click on the "link" to go to share a favorite memory or leave a condolence message for the family.